As per a new report by Transparency Market Research (TMR), there is and will be intense rivalry among the local and global players within the global solid masterbatches market. This market is fragmented with players competing with each other in terms of quality and price differentiation. Players are investing in innovation and technological advancements so as to stay ahead of all competition. The names of the leading players operating within the global solid masterbatches market are Standridge Color Corp., Ampacet Corp., Marval industries Inc., and Cabot Corp. One of the key strategies adopted by the leading players within the global solid masterbatches market is to expand in the developing nations. According to Transparency Market Research, the global solid masterbatches market will expand at a 5.20% CAGR from 2017 to 2022 and US$28.76 bn by 2022 after being evaluated at US$22 bn in 2017. 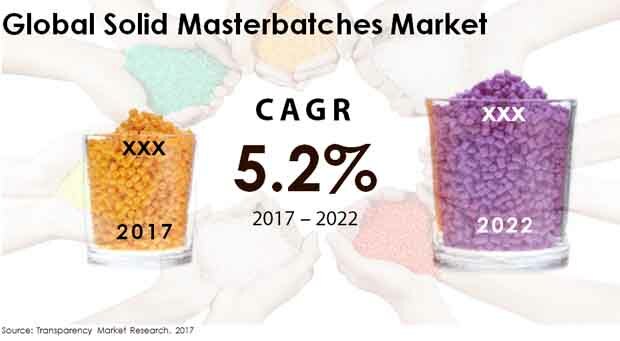 In terms of product type, the global solid masterbatches market is led by the engineering plastics segment which is anticipated to be worth US$8.09 bn by 2022. On the basis of application, the automotive industry and the packaging industry are the two most lucrative areas where solid masterbatches are required extensively. Technological advancements in both automotive and packaging sector will also be the reason behind the growth of these segments within the solid masterbatches market. On the basis of geography, Europe is leading in the solid masterbatches market on account of the rising demand for contamination free packaging for pharmaceutical products. During the forecast period from 2017 to 2022, Europe is anticipated to exhibit a 5% CAGR. North America is another region which is anticipated to show a considerable rise in the demand for solid masterbatches. In 2017, the North America solid masterbatches market was worth US$4.9 bn. In the years to come, on account of the thriving construction and automotive sectors, Asia-Pacific is also anticipated to provide immense growth opportunities for solid masterbatches. As per the lead author of this report, the growth in the automotive sector is the principal reason behind the growth of the global solid masterbatches market. Solid masterbatches are used for the production of plastic products which are required for seat cushions, safety airbags, bumpers, radiator shrouds, filler tubes, clips, and connectors all of which are important components of automobile. The plastic made by solid masterbatches increases the fuel efficiency, safety level, and cost efficiency of automobiles and thus the demand is anticipated to continue to increase from the automotive industry. The groqing preference for biodegradable resins will also work in favour for the solid masterbatches market. On the other hand, volatility in the pricing of raw materials will impact the market negatively.